The columbarium at St. Thomas the Apostle is a beautiful resting place. If you would like more information about the columbarium, please contact Jim Polhamus at the parish office, 865-986-9885 or email Jim. 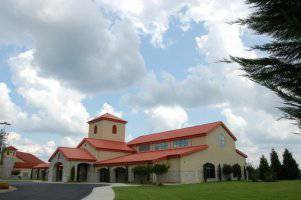 The columbarium has been an important element of our parish since 2005. Over 100 niches have been subscribed and over 60 interments have taken place. Applications may be obtained in the Parish Office. As an alternative to the columbarium, Lakeview Cemetery has established a Catholic Section of 450 grave sites within sight of our Church. The section is identified as SACRED HEART GARDEN.